Chicago Presents ‘Signing Sikura’ - College Hockey, Inc. Follow the Hobey finalist from Northeastern to the Blackhawks lineup. 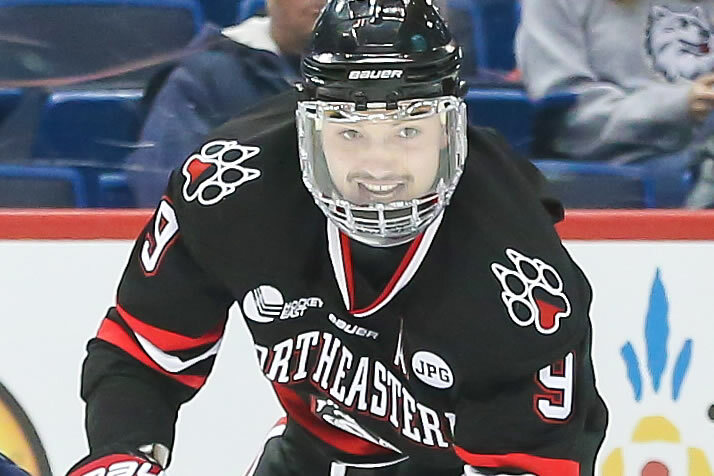 Dylan Sikura recorded 111 points as a junior and senior at Northeastern. Northeastern senior Dylan Sikura had the eyes of Chicago Blackhawks fans on him all season. As seen in “Signing Sikura,” a video produced by the Blackhawks, the organization’s cameras were on him as well. The Blackhawks offered Sikura a contract after his 57-point junior season, but the Aurora, Ontario, native opted to return to school for his senior year. That led to speculation that he may become a free agent and sign elsewhere, but as Sikura says in the video, joining Chicago was always the goal. Before then, he led the Huskies to the Beanpot championship and a return to the NCAA Tournament. He was a Hobey Baker finalist, alongside linemate and eventual Hobey winner Adam Gaudette, and was headed to Chicago shortly after Northeastern’s season ended. The NHL, however, was waiting. And the video captures just how excited the Blackhawks are about the future for the sixth-round draft pick who has developed into a potential star.